Oink first came out about 1986 and ran until, well I'm guessing until November 1988, it was Lard`s attempt to make a Viz style comic for kids, it was published by I.P.C. It was edited by Tony Husband and Patrick Gallagher (later to become the studio audience on the Breakfast Show). Lard somehow managed to become a cartoonist for the comic. The basic premise was a comic which was run by pigs. The Editor was called Uncle Pig. He was a cool large swine. He was constantly being criticised by the in-hose critic, Mary Lighthouse, who always came a cropper. Harry the Head - The adventures of Harry a head, no mention of how this decapitation occurred. This was one of Lard's efforts. Incidentally, Harry's best mate, Barny, looked like Barny Sumner. Frank Sidebottom made several appearances, some in photo stories with Lard in his Snatcher Sam mode. 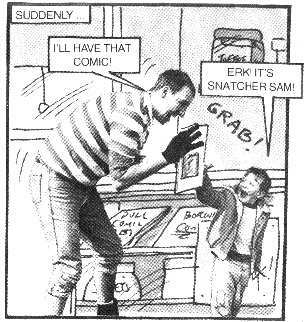 To the right is a picture of Lard in a Snatcher Sam strip. Lard released a 7" single called Oink! which featured him and Frank Sidebottom to help promote the comic. Pete and his Pimple-about a boy with a huge pimple Tom Thug- about a thick teenage bovver boy, with black cat called 'Satan' or was it 'Satin'? When Dinosaurs ruled the earth-Comic capers with T-Rex and friends, this was a Lardy boy effort, some of the comic was cartoons and some of it was made of photo stories which Lard often stared in himself. Lard also did "Doctor Mooney - he's completely looney"
There was also Billy's Brain - A boy with a pet brain. Oink! was finally scrapped in November 1988. It was fairly successful but the sales figures were fluctuating too much. Sometimes it was in the adult comic section with comics such as Viz and at other times it was placed with the Beano and The Dandy causing the figures to vary too much. Apparently WHSmith also banned it from all of their shops which quickly brought the comic to an end. When the comic folded Pete and his Pimple, Tom Thug and Weedy Willy went onto "Buster" comic but were incredibly toned down (eg Pete's pimple never burst and covered everyone with pus after the move....!). Lard who always seemed to be busy doing something had no need to worry about what to do next as he was soon to embark on his journey into radio. Thanks To Tony for the information and Rob Sedgebeer for some more info and for letting me use his Oink! pictures.